Working with Emily was one of the best decisions we made when planning our wedding. Though we relied more heavily on her services for day-of coordination, I really don’t think our wedding day would have been as smooth as it was without her. From the rehearsal, to the decorations, to helping to coordinate our First Look, to making sure we got all the photos we wanted, to making sure our ceremony and reception all went as planned. Our dog was part of our first look (but couldn't be at our ceremony) and her husband even helped by taking him to daycare once our First Look pictures were done. It was a genuine pleasure working with Emily over the last year and couldn’t be more appreciative of all of her help. Emily and Jenna were incredible! I couldn't not speak more highly of them. Emily was so easy to talk to and very responsive by phone, email or text. On the day of our wedding Feathered Events was early and ready to go. They set up our reception ballroom and made it look beautiful. They were incredibly kind and fun. It felt like they were friends that we had known for a long time. I had no stress while getting ready for the wedding because I knew that everything was under control. They anticipated our every need during the reception. Feathered events went above and beyond. While I hired them for DOC, Emily came up the night before for the rehearsal and she sent me a message the next morning offering to come back for any additional clean up. She also took a video of our first dance to share with my grandparents. I recommend Feathered Events to everyone! You will not be disappointed. We hired Emily as the Day-Of Event Planner for my daughter's wedding. She was very helpful and professional and went above and beyond what we had in mind. 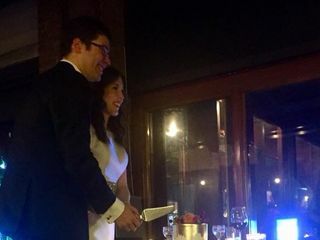 She attended meetings with us at the restaurant and followed up on our plans to be sure she had everything we (and she) needed for the big day. Her suggestions prior to the wedding were smart and sensible. We were so happy to have found her. On the wedding day we knew we were in the best hands with Emily - along with her associate, Jenna. We had many comments from guests about them as they made the rounds constantly to be sure everyone had what they needed during the evening. They were friendly and energetic and covered all the bases. I would be happy to recommend them to my friends and family. Event ran smoothly, everything was wonderful. Emily put me at ease and let me actually enjoy my wedding. Hiring her was our best decision! Emily and her staff were incredibly helpful, jumping in where we asked and where we didn't even know we needed them! Emily listened to what we needed, made helpful suggestions, and gave us 100% confidence we wouldn't have to worry about a thing. And, we didn't! I would highly recommend Feathered Events to anyone. 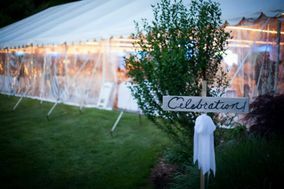 From a casual backyard wedding to a black tie event, Feathered Events will be with you every step of the way. Thank you, Feathered Events!!! Emily and her team were amazing on the day of our wedding! 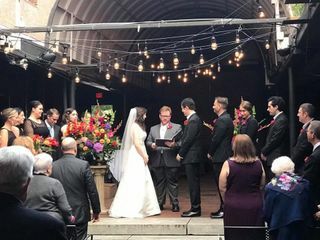 They set-up all our details and coordinated our vendors (and broke everything down at the end) so that we didn't have to think twice about anything on the day of! Emily was also available for all my questions weeks and days before. She goes above and beyond as a "day of" planner and our wedding wouldn't have been what it was without her! I highly recommend her! Emily is by far the one you want to help plan your wedding!! She has gone above and beyond in preparing for our big day. She has such an incredible talent and has a way of taking the stress away from you, making the planning that much more enjoyable and fun. She always responds so quickly and has a brilliant idea for every aspect of our wedding! I would highly recommend Feathered Events. We just love her!!!! My husband and I cannot say enough good things about Emily and Laura! Our original day of coordinator cancelled and I was panicking until my husband and I met Emily and Laura for lunch. They were so friendly, sweet, and helpful, and took so much stress away. They were very responsive to emails and text messages, and made sure everything was set for our special day. They went above and beyond by picking up the wedding decorations from our hotel the day before, and helped us track down our pie cutter when it was misplaced. The day of the wedding it rained (the ceremony was supposed to be outside), and I had made about 400 paper hearts on skewers to line the aisle. They already had a plan and made an aisle for my husband and I under the tent with the hearts. My husband and I highly recommend Feathered Events for your upcoming wedding or event. Emily and Laura do not treat you like clients, they treat you like family. Thank you!! There aren't enough words to describe how helpful Emily was throughout this whole process! We had a number of hiccups and changes and she was with us and supportive the whole way. Emily completely understood our direction and added the perfect touches we were looking for in unique and cost effective ways. She also added a level of excitement to everything she did that made us feel better about our decisions throughout the process. Emily was always available when we had questions, concerns or new ideas. We highly recommend her! We couldn't have done this without her! Emily has made my wedding planning experience a breeze from day one. She is brilliantly talented in every aspect of her work. She has an idea or a suggestion for every detail from the venue or ceremony location down to what color flowers will look best on your special day. She is a sweetheart and has been a pleasure to work with from the very beginning. I will recommend Feathered Events by Emily Lam to anyone looking for an event planner for a long time to come. Emily was top notch, professional, helpful, organized and ensured our wedding was beautiful and well structured and most of all turned out to be a great time for everyone! She went above and beyond expectations. I highly recommend Emily to all my friends. We cannot thank Emily enough for everything that she did to help with our wedding!!! She is so unbelievably talented! She was able to skillfully balance her creative insights with the visions that we had for our wedding! Her patience and confidence were so reassuring during such a stressful time! I'm so grateful to have had Emily's helpful expertise during such an important time in my life! Emily was willing to drive two hours, one way to be available at the location of our daughters wedding. She lead the set up of an outdoor ceremony and reception. I can not say enough about how well she did to get us set up in 2 hours. Fantastic help. Emily is a flexible, thoughtful, reliable, attentive, and creative wedding consultant and planner (and yes, I could come up with way more positive adjectives)! She helped me organize my thoughts and ideas in the later stages of my wedding planning, as well as made valuable suggestions that helped truly make my wedding a success. She demonstrated enthusiasm and dedication on the day of my wedding to lead the set-up, decorating, food distribution, and overall flow of the reception. I had the wedding of my dreams and I could not be more thankful that Emily was a part of that day. I would wish future brides and grooms good luck while planning, but if you choose Feathered Events by Emily, you won't need it :) Happy planning! Emily is very attentive to detail and helped me from beginning to end. She reminded me of things that I didn't even think of, which totally tied the whole wedding together. She even shopped with me for decor. She is completely flexible and on board with whatever I had visioned, but still had create ideas to spruce it up a bit. She is always available to help, and she went above and beyond! I highly recommend feathered events! They were great! I felt so comfortable having them set up for our outdoor wedding. Everything turned out great! Well worth the money and kept my mind focused on being the bride.